At the Sony media briefing, Bandai Namco Games has confirmed Tekken 7 for home systems. New trailer inside. 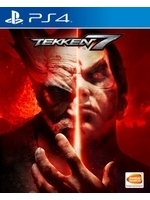 SAN JOSE, Calif., (October 27, 2015) – Leading interactive entertainment media publisher and developer BANDAI NAMCO Entertainment America Inc. today announces TEKKEN 7 for home systems. With the TEKKEN franchise celebrating its 20th anniversary; the newest chapter of the series returns to its gameplay roots with classic 1 vs 1 bouts and its canon storyline centered on the eternal struggle for power amongst the members of the Mishima clan. With newcomer Kazumi Mishima joining the fight, the epic battle between father and son, and also husband and wife, will come to its fated conclusion in TEKKEN 7.